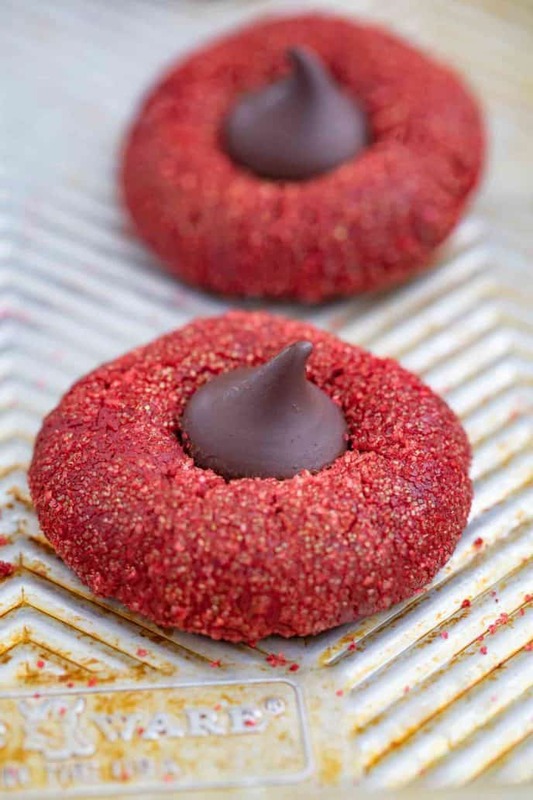 Red Velvet Kiss Cookies tastes like rich red velvet cupcakes in cookie form with a Hershey’s Kiss chocolate in the middle, the perfect holiday baking cookie. 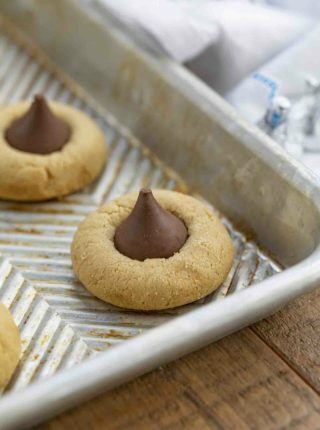 Hershey’s Kiss Cookies are easy and impressive cookies we enjoy baking like our Peanut Butter Blossom Cookies and our Classic Hershey’s Kiss Cookies we already have on the site. Make all three for the perfect easy holiday baking platter! Red Velvet Cookies are a natural option for the site after our Red Velvet Cake with Cream Cheese frosting and Red Velvet Cupcakes were posted around Valentine’s Day. 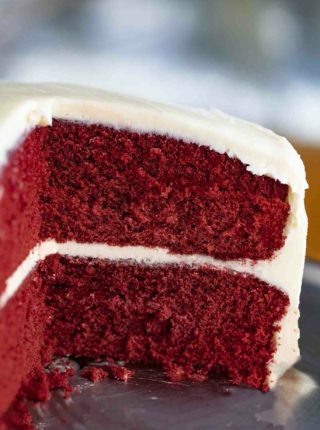 Red Velvet flavor may seem confusing but it’s a light cocoa flavor with buttery finish. The red color comes of course from food coloring. 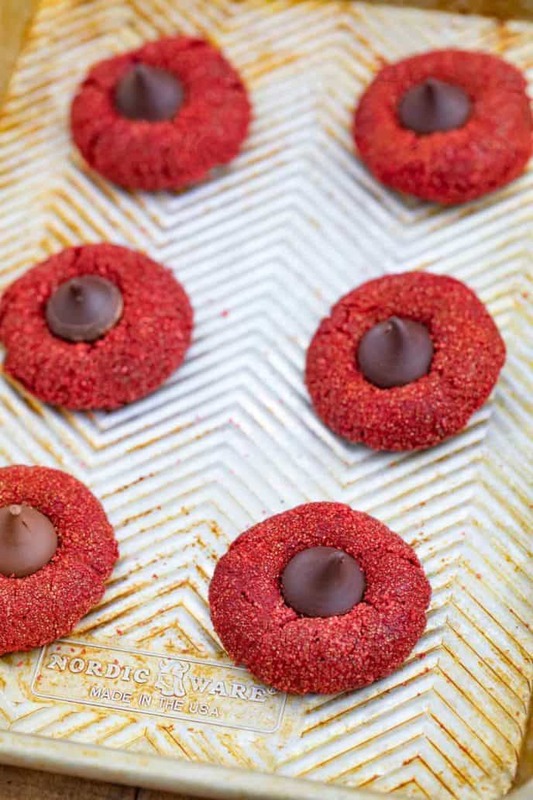 Many recipes for red velvet cookies come from red velvet cake mix but these cookies are baked from scratch. You can make them in just a few minutes so don’t be intimidated by the lack of cake mix in this recipe. If you want to skip the sanding sugar next time you can also roll the cookies in powdered sugar before baking to make them into crinkle cookies skipping the chocolate chips altogether. You can also use Hershey’s Hugs which are white chocolate and milk chocolate striped kisses. Use a combo of brown sugar and white sugar in your cookie recipe like we do in this one make the best cookies. Under bake by 1-2 minutes if you find your cookies are coming out more crisp than you’d like. If you mix the flour too much in the recipe the cookies can be too dry. Refrigerate your cookie dough to keep the cookies thicker if you find they are baking too thin. Use a good quality baking sheet/cookie sheet. WHY ARE MY Kiss Cookies FLAT? When your butter gets too warm your cookies will flatten too quickly in the oven. We need the butter to be softened to cream it well but the time it spends in the refrigerator gives it some time to firm back up to bake into a thicker cookie. Make sure to allow time for these cookies to cool in the refrigerator properly before baking. 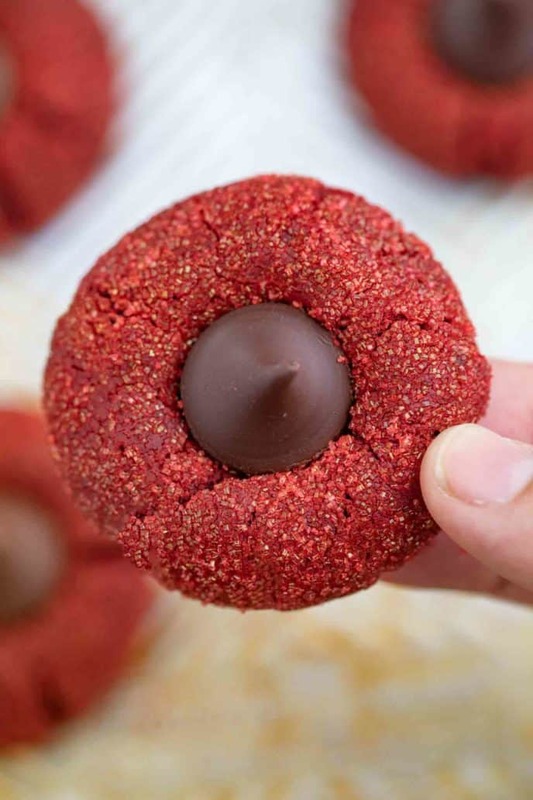 Since these cookies contain large chocolates make sure they are stored in a cool spot in single layers or the chocolate kisses will get marks on them and melt. When storing be sure to store in airtight containers, they will stay fresh for up to one week. Can you freeze Kiss Cookies? 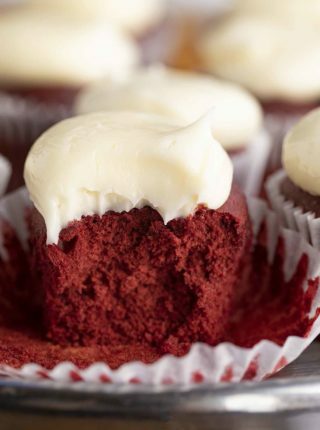 Freeze your Red Velvet Kiss Cookies with parchment paper between layers, in an airtight container to prevent freezer burn. Use a good silicone mat/baking mat to prevent the bottoms of the cookies from overcooking. Always make sure your oven is at the correct temperature. Make sure to handle the cookie dough a minimal amount before baking, the butter staying cold will keep the cookies thicker, like a pillow. If your cookies crack when baking your dough was too dry. This means you added too much flour likely from scooping rather than spooning flour into your measure. Always sift your dry ingredients when baking and always add it to your recipe on low speed until just mixed in. The less your flour interacts with the cookie dough the less the gluten works to create a tougher dough. Let your cookies cool completely on a wire rack instead of on the baking sheet. I only let them cool on the baking sheet for a couple minutes to firm up before removing them. Using a cookie scoop ensures all your cookies will be the same size. Instead of using a stand mixer you can use a large bowl and hand mixer since you only need to beat butter with sugar and the rest of the ingredients only need to be barely combined. When measuring flour for baking do not put your measuring cup directly into your flour container. This is not an accurate way to measure flour as the scooping packs in more flour than you need. Instead use a clean spoon to spoon flour into your measuring cup, then level it off. Do not use any utensils in measuring ingredients before using them with your flour, this can cause cross contamination in your flour container according to FoodSafety.gov. 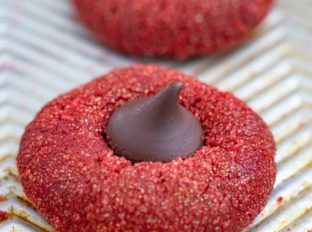 Red Velvet Kiss Cookies tastes like rich red velvet cupcakes in cookie form with a Hershey's Kiss chocolate in the middle, the perfect holiday baking cookie. Preheat the oven to 350 degrees and add the butter, brown sugar and sugar on medium speed for 1-2 minutes until light and fluffy. While the butter is creaming sift the flour, cocoa powder, baking soda and baking powder in a seperate bowl. Add the eggs, vanilla and red food coloring to your stand mixer for 15 seconds then add in the flour mixture. Scoop the cookies with a 1 tablespoon sized cookie scoop and roll in sanding sugar then refrigerate for 20 minutes. 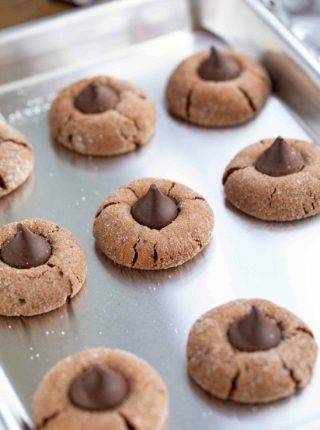 Bake on a cookie sheet for 11-13 minutes then as soon as they come out of the oven press a Hershey's Kiss chocolate into the middle of the cookie and allow them to cool on a wire rack. So pretty and such a fun idea! These are perfect for summer picnics! They are a perfect treat for sure! They are so adorable and delicious! Perfect treats! I could eat these every day! mmmm… these red velvet cookies sound incredible!! I bet they taste amaaaazing!!! Pretty and delicious! A killer combo.